I also like this dress with an ivory faux fur jacket swapped in for the silver fox stole (see it here). The dress is INC (Macy's); The boots are from Shoedazzle.com. My maternal grandfather, Harold Coy, was a handsome, slender man with a shock of soft, snow white hair. As a result, he was widely known among his friends (and my grandmother's) as "the Silver Fox." I just called him Grandpa, but I recalled the nickname (and his memory) fondly when a friend recently surprised me with this vintage, decades old silver fox stole that once belonged to his mother. I was honored that my friend chose me to give it new life, and I hope that I honor his mother's memory, as well as my Grandpa Harold's, each time I wear it. 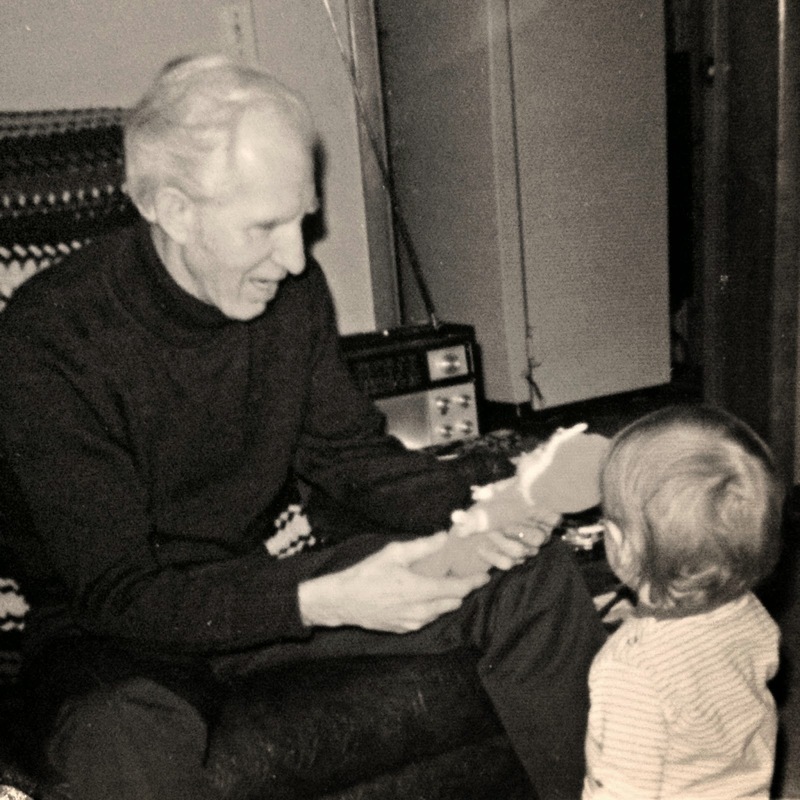 The "Silver Fox" with me and my doll, Baby Beans, on Christmas Eve i n 1973. Actually, all of the "details" of this ensemble (worn for a recent holiday fete) are a nod to the past. The hat is from the 1950s, and the diamond and white gold Wyler watch is from the 1940s. And then there is the purse. Oh, the purse! This tiny little evening bag with hundreds of hand-sewn seed pearls and crystal beads is more than one hundred years old! 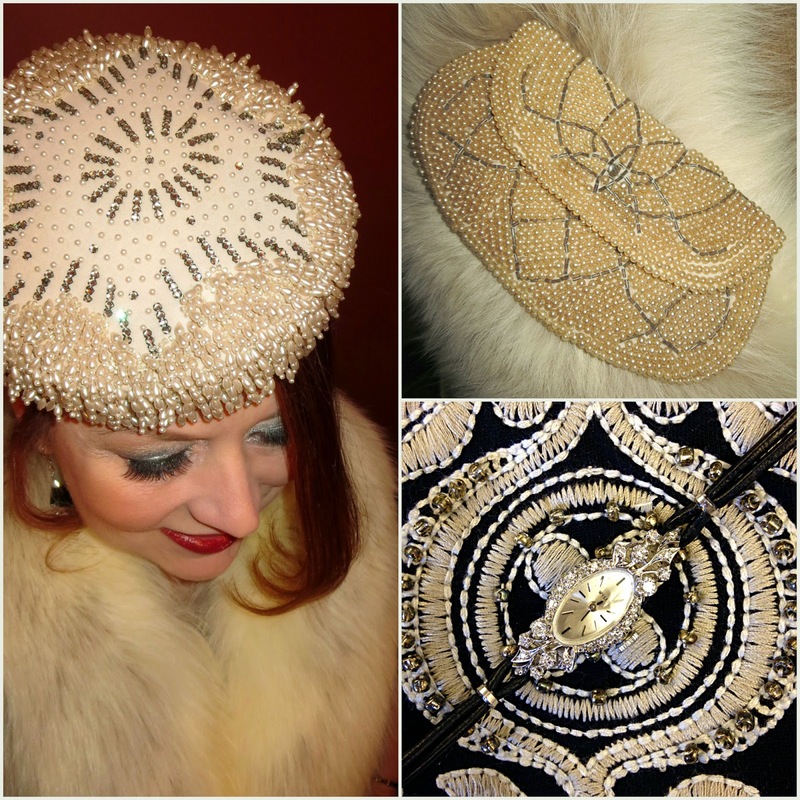 The diminutive pearl clutch is in remarkable condition for it's age, but I probably won't carry it often - it's simply too precious as a family heirloom; The 1950s hat is from Viva Vintage Clothing; The 1940s Wyler watch is from the estate collection at G. Thrapp Jewelers. It belonged to my great grandmother, Zelda. It was part of her wedding trousseau in 1902. I never met Zelda, and I don't know too much about her. I look forward to sitting down with my mom to look at old pictures and learn more. What I do know is that her evening bag was beautiful and her waist was a waifish 18 inches when she married my great grandfather. I know this because, throughout my childhood, the little beaded clutch was stored in the drawer of an antique trundle sewing machine in the corner of our dining room along with a silk hook and eye sash that was part of her wedding ensemble. Though elegant, the sash looks child-sized, though I suppose she wore the tightly laced, boned corsets of the time period. As beautiful as it is, that's one heirloom garment that will be forever cherished, but certainly never worn by this girl! 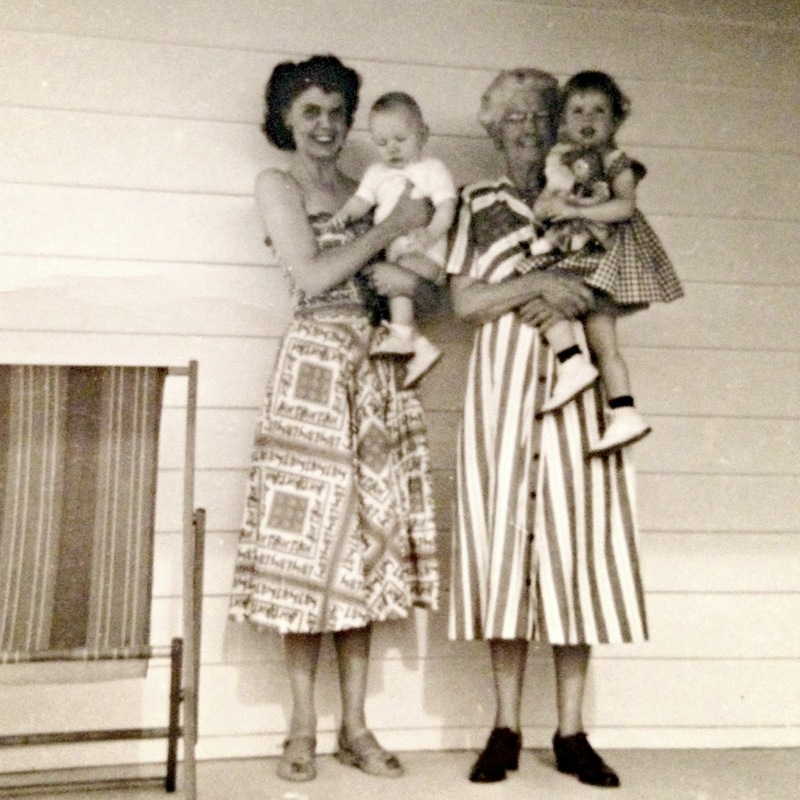 My grandmother (and style icon) Dorothy with Zelda and my mom. Zelda is holding my mom as a little girl. When you wear multiple vintage details at one time, an outfit can look more "period costume" than party perfect. Since that was not the effect I was going for here, I paired the timeless accessories with a modern embroidered and beaded jersey dress and knee high suede boots to add a modern edge.